Cross worded | Writing about writing, design and life. In my own words. I closed down The Carolina Ledger last fall and have been enjoying a quiet break from the frenetic news cycle. One story I can’t ignore is the ongoing obsession with a CNN article revealing that Fox News had killed its own report, which detailed allegations of a bribe to silence Stormy Daniels about her alleged relationship with then-candidate Donald Trump. After taking a bit of a sabbatical (hi, friends, how’ve you been?) I thought we’d talk about something basic today–giving your web-based marketing materials a last look before hitting send. My process may sound simple and obvious, but I run across so many mistakes that should have been easily caught–especially if the publisher has a good editor. So it’s important to have a process for catching simple mistakes. I avoid most awareness campaigns because they are by nature fad-like, and frequently fail to lead to substantive change. But I think most people in my circles aren’t aware of what Lyme Disease looks like. May is Lyme Disease awareness month, its campaign marked with the social media hashtag, #takeabiteoutoflyme. Participants bite into a lime and share the photo and hashtag on social media. May also roughly marks the season when suddenly, six years ago, I found myself too weak to ascend a flight of steps. Otherwise reasonably fit, I knew something was terribly wrong. What followed was an odyssey to discover the source of the problem. A Portland, Maine dairy company will have to shell out $10 million because of an overtime pay statute and a comma, a court has ruled. The ruling, according to a March report by The New York Times, is resulting from ambiguity caused by the Oxford comma–or in this case, a lack thereof. I usually avoid change, but it was time for one. 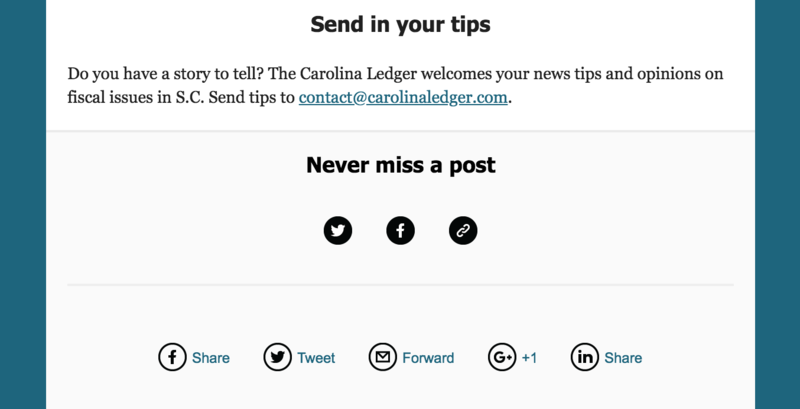 Tahoma has served The Carolina Ledger newsletter well since I started it, but this week I finally ditched it, opting instead for Helvetica for headlines. Try to read a sentence with seven commas that aren’t used for dividing a list. I dare you. I was reading through a handful of news stories Wednesday following the roads funding debate in the Senate. One story was written by a veteran reporter at an unnamed S.C. daily–unnamed because I don’t want to credit the publication in this case, thereby calling it out directly. She asked my name. Hers is Anna, or some English equivalent that sounds like Anna. She wore mismatched socks–one, orange and black with candy corn, the other, pink and black with lips. I told her the word for pink and pointed at her sock. She showed me how she could count to 10 by taking fingers away. I love a good pun. Good, bad or ugly, none is master of the pun more than the animated franchise, Bob’s Burgers. It’s a lovable show about a burger joint owner and his family, which is constantly (lovingly?) sabotaging his business. When I think of what makes for good copy, I think of things that make me laugh or think. Good copy is memorable, concise and consistent. I have a soft spot for copy that is funny and whimsical.